The Judy Chicago Art Education Award was established by Through the Flower to support artists, scholars, and educators who through their art, research, teaching, and leadership have contributed to ending the erasure of women’s history. Through the Flower, a non-profit art organization, invites artists, scholars, and educators to apply for the 2019 Judy Chicago Art Education Award (JCAE). The award, named in honor of one of the Feminist Art Movement’s key founders and a pioneer of feminist art education, is awarded annually to projects which utilize any of the three Judy Chicago archives as a resource for research and/or teaching. Penn State University Libraries, Eberly Family Special Collections Library, which houses the Judy Chicago Art Education Collection and The Dinner Party Curriculum Project. The National Museum of Women in the Arts (NMWA), Betty Boyd Dettre Library and Research Center, home of the Judy Chicago Visual Archive. Harvard University’s Arthur and Elizabeth Schlesinger Library on the History of Women in America which includes letters, papers, and recordings of congressional hearings about The Dinner Party. along with a certificate signed by Judy Chicago. The award was established in 2011 to support projects that utilize Judy Chicago archives at any of the three institutions that comprise the Judy Chicago Portal. The JC Portal will be launched on October 18, 2019, at the Schlesinger Library in Cambridge, MA, in conjunction with the Judy Chicago Art Education award ceremony. Criteria for the completed or proposed project utilizing the Judy Chicago Collections must include evidence of use of one or more of the three archives for research or teaching projects. Projects should encompass feminist goals such as understanding and appreciation for the achievements of women, gender equity/justice, or the use of Judy Chicago’s participatory art pedagogy informed by feminist principles. The applicant’s project must also include a public presentation such as a lecture, publication, or class activity. The three participating institutions provide separate applications for internships and travel grants, which could be used to explore the Judy Chicago collections. More information can be found at NMWA internships, Schlesinger travel grants, and Penn State travel grants. Award submission will be accepted online only until midnight on 6/1/19. 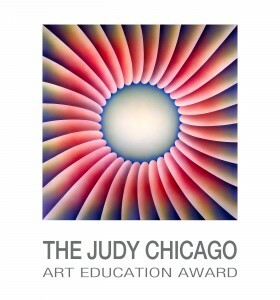 Details are available at Judy Chicago Art Education Award. Internships or Travel Grants include: NMWA internships, Schlesinger travel grants, and Penn State travel grants. Use one or more of the three archives. Projects that do not use materials from the Judy Chicago collections in the archives are ineligible. A public presentation of the applicant’s project — such as a lecture, publication, or class activity. Title: Specific to convey the research/teaching project. Applicant(s) Information: name, contact (email, phone, address), short biography of the applicant(s), institutional affiliation, if applicable. Use of one or more of the three archives. Theories or concepts central to the project. Methodology (i.e.,, teaching approach or research mode of inquiry). Significance (an explanation of why the teaching/study is important and for whom). Completed or planned public presentation of the project. Materials from the collections cited in the abstract. Texts cited in the abstract that contextualize the study and substantiate claims. Applications may include supplemental materials such as images, video, art, publications, and hyperlinks. Penn State’s School of Visual Arts administers the award. Press release PDF linked here.